Our C.A.R.E. – Create a Ripple Effect program is one that we take pride in. It has successfully helped to support the growth of our communities in more ways than one. In 2011, one of our three legacy companies, Farmers’ Mutual Insurance Company (Lindsay), chose to start giving time and funds to community initiatives that promote the wellbeing of children, and the health and safety of their neighbours. 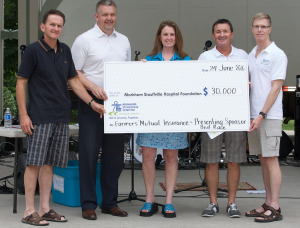 The Commonwell Mutual Insurance Group is honoured to continue these efforts. Farmers’ Mutual Insurance Company’s C.A.R.E. – Create A Ripple Effect program supported the Alzheimer Society of Peterborough, Kawartha Lakes, Northumberland & Haliburton with a donation of $5,000.00. These funds will be used to support the current programs and services provided by the Alzheimer Society and to close the gap between the increasing client volume and the resources needed to deliver those services. 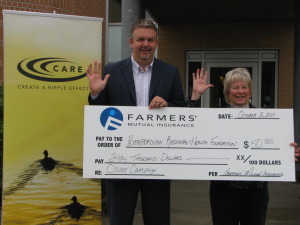 Community Care Foundation (Kawartha Lakes) received a donation of $15,000.00 from the C.A.R.E – Create a Ripple Effect program as presented by Tim Shauf, President and CEO of Farmers’ Mutual to Catherine Danbrook, CEO of Community Care Foundation. These funds will be used to help provide dental care for 60 children, who currently have no access dental care, with annual check-ups, x-rays, filings and cleaning through their Dental Clinic. 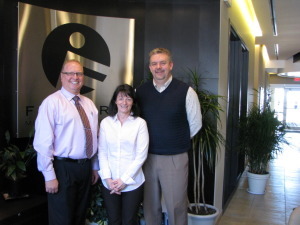 Tim Shauf, President and Chief Executive Officer of Farmer’s Mutual presented a cheque for $15,000 to Big Brothers Big Sisters of North Durham Region, represented above by Margaret Ayers, Executive Director and Terry Voss, Director of Big Brothers Big Sisters North Durham Region. The proceeds will be used to assist with the In-School Mentoring Program. 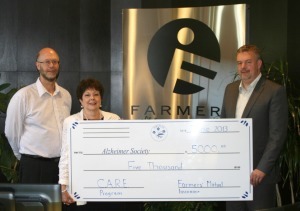 Tim Shauf, President and CEO of Farmers’ Mutual and members of the C.A.R.E. 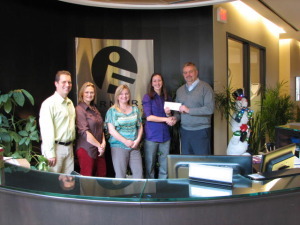 – Create a Ripple Effect Committee present Jen Armitage, Community Student Nutrition Program Coordinator, Food For Kids, City of Kawartha Lakes, with a cheque in the amount of $10,000.00. Food For Kids is the community organization that co-ordinates 46 nutrition programs at schools across the area. All funds raised by Food For Kids are used to purchase healthy, nutritious foods and kitchen supplies for the nutrition programs. 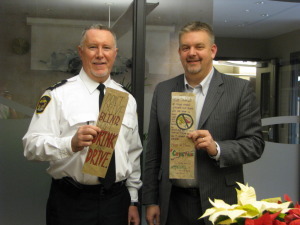 City of Kawartha Lakes, Chief of Police John Hagarty and Tim Shauf, President and CEO of Farmers’ Mutual Farmers’ Mutual supports the City of Kawartha Lakes Police Services annual Brown Bag Drinking and Driving Awareness campaign. The purpose of the campaign is to educate children across the City of Kawartha Lakes in Grades 4-8, on the impact of drinking and driving. Farmers’ Mutual’s C.A.R.E. 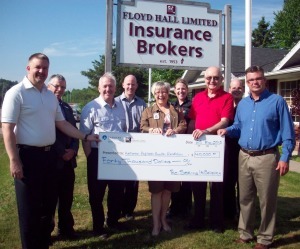 – Create a Ripple Effect program and Floyd Hall Insurance support the Haliburton Highlands Hospital Foundation with a cheque for $40,000. Farmers’ Mutual’s C.A.R.E. – Create a Ripple Effect program supports the Markham Stouffville Hospital with $30,000 to help with their expansion project. Farmers’ Mutual’s C.A.R.E. – Create a Ripple Effect program supports the Peterborough Regional Health Centre’s Closer Campaign with a Donation of $50,000. 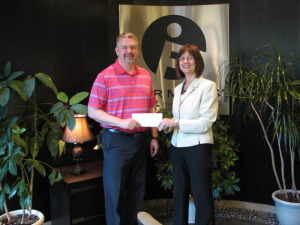 Pictured above are: Tim Shauf, President and CEO of Farmers’ Mutual and Margie Lightbody, Chair of the Community Campaign Team. 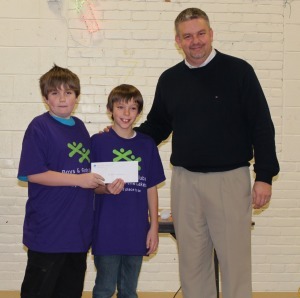 Tim Shauf, President and CEO of Farmers’ Mutual presents a cheque for $26,164.80 to a group of Boys and Girls Club members.